Keeping the Indian tradition alive in all our manufacturing and processing techniques that are used in the preparation of variety of pappadums, we bring forth a tangy variety of Chilli Appalam Papads for our clients. Our variety includes Green Chilli Appalams and Crushed Red Chilli Appalams that are made from finely sorted and crushed chilli. Widely known for hygienic processing used for preparation of these papads, we ensure that these will steal hearts of food lovers across the globe for its taste and quality. We invite inquiries from our buyers across the world and ensure to deliver the consignment within a stipulated frame of time without compromising on quality. We are manufacturers of Chilli Papad/Appalam/Poppadom that are prepared using qualitative hand-picked red as well as green chillies. 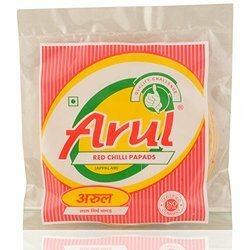 We offer Red Chilli Appalams/Red Chilli Papad, which are manufactured in compliance with the quality norms of the food industry ensuring complete quality. 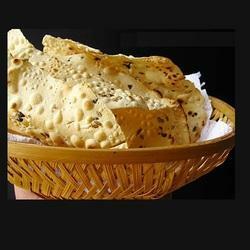 These papads are processed with crushed red chili, which is carefully picked, dried and them crushed in powder. The right knowledge of the right mount of all the ingredients to be used ensure great taste and flavors in these papads.